As with all racing safety equipment, helmet fitment is critically important, and the helmet user can increase the risk of injury if they are not fitted properly. Please refer to the general helmet sizing chart below for proper helmet fitment. This chart is for ADULT helmet sizing only unless certain manufacturers include YOUTH/JUNIOR sizes in their chart. Otherwise, all YOUTH and JUNIOR helmet sizes will be shown below in a completely separate chart. Please first refer to your hat size. If you do not know your hat size, use a cloth tape measure and measure around the circumference of your head, just above your brow line. 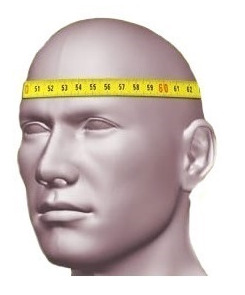 Measure the head approximately one inch above the eyebrows across a point at the back of the head that gives the largest measurement. IMPORTANT NOTE: All helmets will &apos;Break-In&apos; when first used. It is VERY important that the helmet fits as tight as one can comfortably withstand to wear. Please remember that Racecar Engineering™ carries a full assortment of helmet accessories for the entire Bell® Helmets-USA brand. 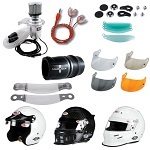 We have in stock and ready to ship, replacement helmet shields, radio ear pieces, tear-offs, helmet storage bags and much, much more. Feel free to browse our wide selection of Bell® Helmets-USA products and buy online today. If you have questions about choosing the right racing helmet for your respective motorsports segment, please contact one of our Technical Sales Associates for assistance. 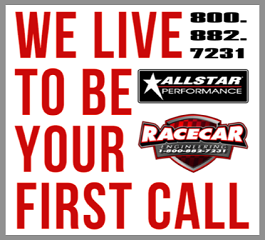 At Racecar Engineering™ we work very hard to be every racer&apos;s &apos;One-Stop Racing Safety Shop&apos;. *** HELMET SIZING/FITMENT CHART DISCLAIMER: This helmet sizing/fitment chart has been created by Racecar Engineering™ for our customer&apos;s reference and ease-of-use using the latest fitment information available from the factory. Please always refer to the factory website, factory printed materials and factory personnel advice for the latest helmet information about their brand of safety product. The Bell® Helmets-USA factory website can be accessed directly at www.bellracing.com. (link opens new page) - Racecar Engineering™ is not responsible for any typographical errors contained in this helmet sizing chart/fitment material or the end-user&apos;s failure to verify & follow factory fitment specifications.